During the Babylonian captivity (586–537 BCE)[ citation needed] the men of the Great Assembly[ dubious – discuss] formalized and standardized the language of the Jewish prayers. Prior to that people prayed as they saw fit, with each individual praying in his or her own way, and there were no standard prayers that were recited. The Leopoldstädter Tempel of Vienna, destroyed during the " Kristallnacht" pogrom. 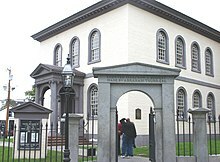 Served as model for many other important synagogues. The main synagogue of the city of Frankfurt am Main ( Germany) before the Kristallnacht.